Happy Wednesday, friends!! Welcome to another Wednesday’s Favorites. 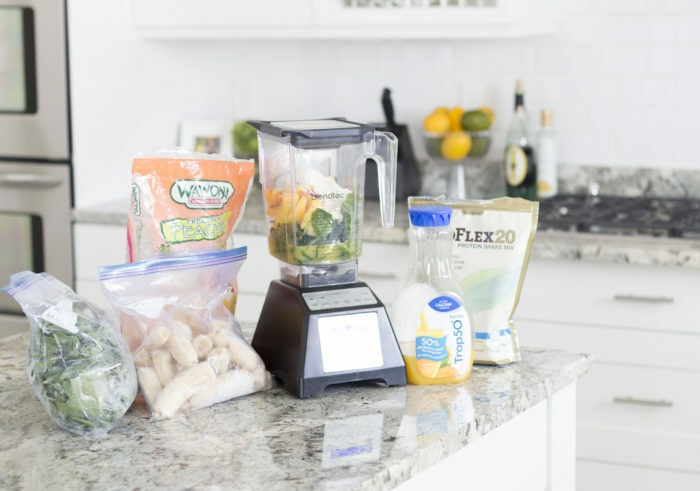 Today I wanted to share with you my favorite kitchen essentials right now. 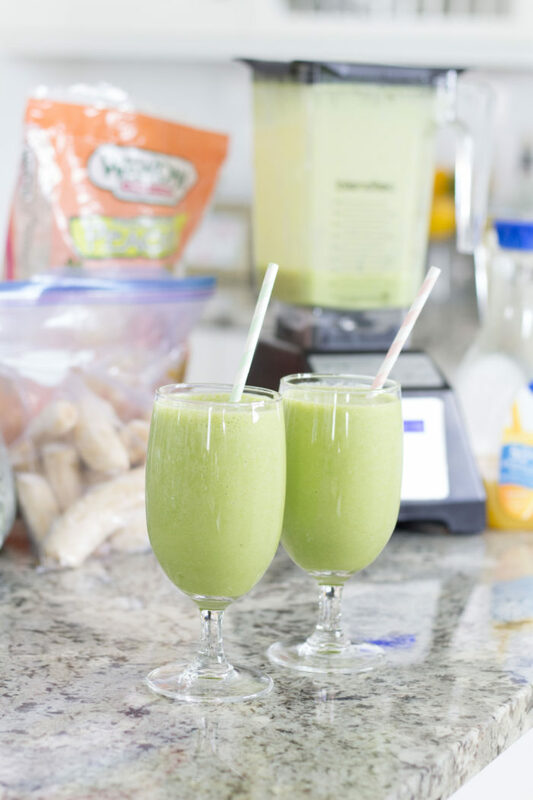 First, the BEST green smoothie shake of all time! It literally tastes like an Orange Julius. Oh, yeah, sister. You heard me right. I don’t have exact measurements because I grab it and throw it into my Blendtec every morning, but it always makes enough for at least 3 people. What I like to do is drink a glass right then, make Tyler a glass, and then put one in the fridge for myself when I get hungry an hour later. Trop 50 (I LOVE this stuff! I think it tastes way better than orange juice and it’s sweetened with stevia which is natural. It has 50% of the calories and 50% of the sugar as regular orange juice). 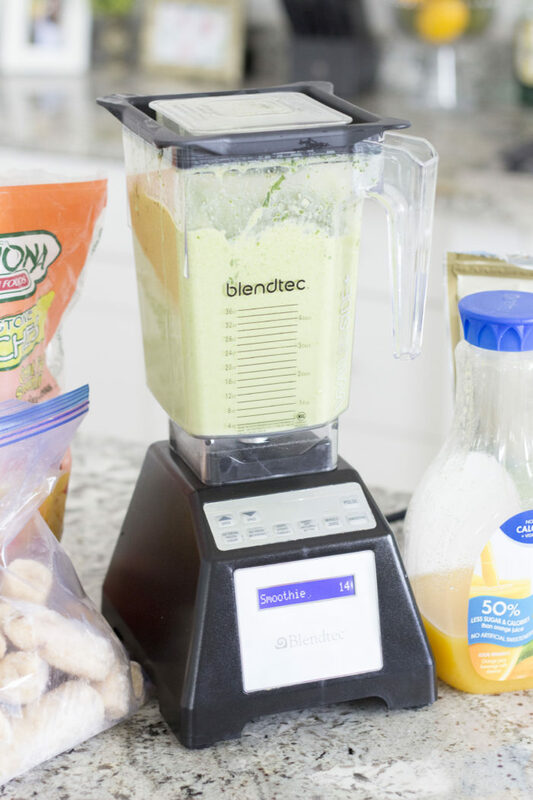 Also, I can’t begin to tell you how much I love my Blendtec. We bought ours about 3 years ago and I wasn’t sold at first when Tyler wanted to buy it. It’s expensive for a blender! We had stopped making smoothies because nothing could blend well so we just got fed up with making them. I am so glad that we bought it. 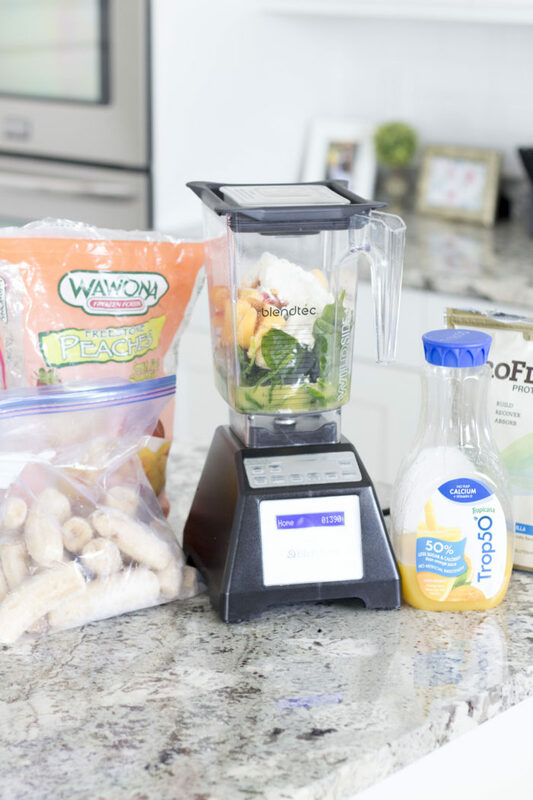 We literally use it every single day to make a healthy smoothie in the morning. I even used it to grind wheat for the bread I made on Sunday (try this recipe…it’s incredible)!! That’s how well it blends. No more stopping and stirring. I’m literally obsessed. This is the best deal + it has a 3 year warranty! My jar broke after about a year (the blade was having issues…I use it SO MUCH), I called Blendtec, and they shipped me a new one and I had it within 2 days. They have the best customer service! 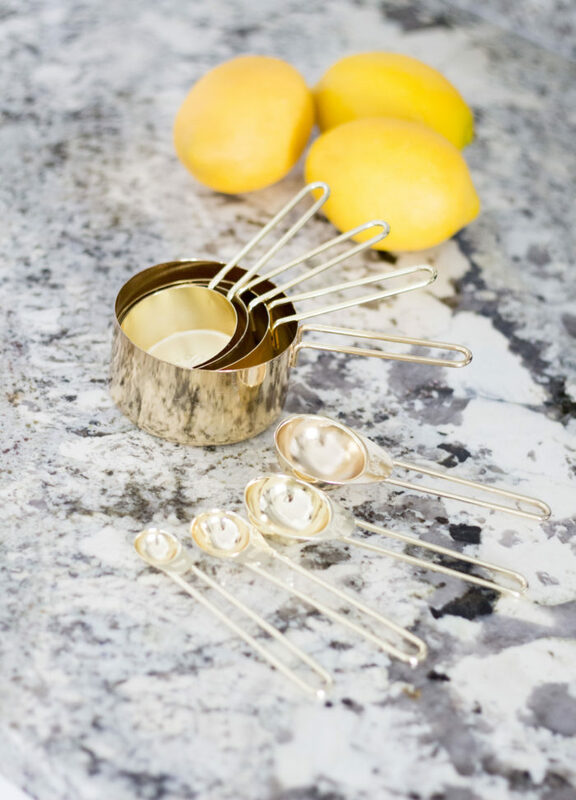 I’m also in love with anything gold, so these gold measuring cups and gold measuring spoons are used any time I cook or bake! Previous Post: « Looking Forward to Spring + Our New Stroller! Hello! The Blendtec site says 3 year warranty but you mentioned 7 year warranty. Do you know which is correct? Oh my goodness; they changed it since I last posted about it!! I’m sorry. Thank you so much for letting me know! Looks really good! I like that it doesn’t have milk or soy/almond in it. Hard to find a recipe that doesn’t. Any idea how many calories are in this? Also…totally off subject…, what do you use to place Goldie’s little bows on her head? They are so cute! 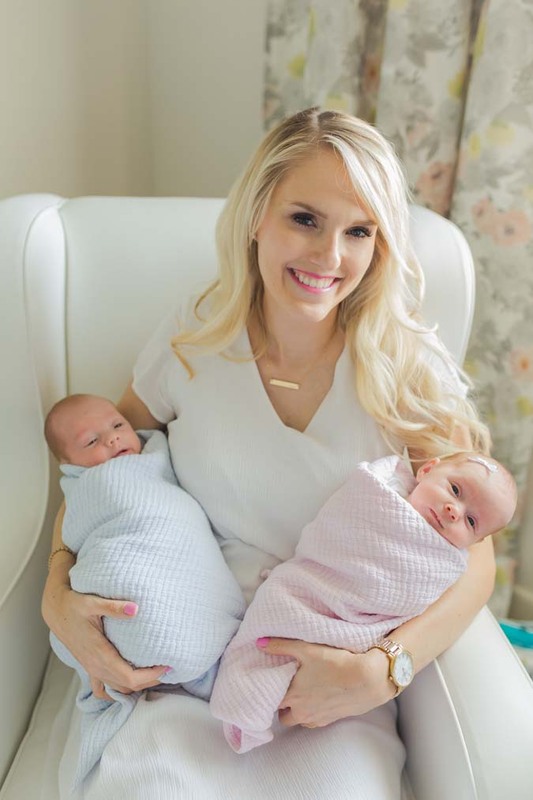 Those babies are precious! I use Girlie Glue! You can buy it online. Thank you so much! I buy it from Melaleuca! Email my friend Georgia (georgia.palmer@gmail.com) and she’ll give you all the info. 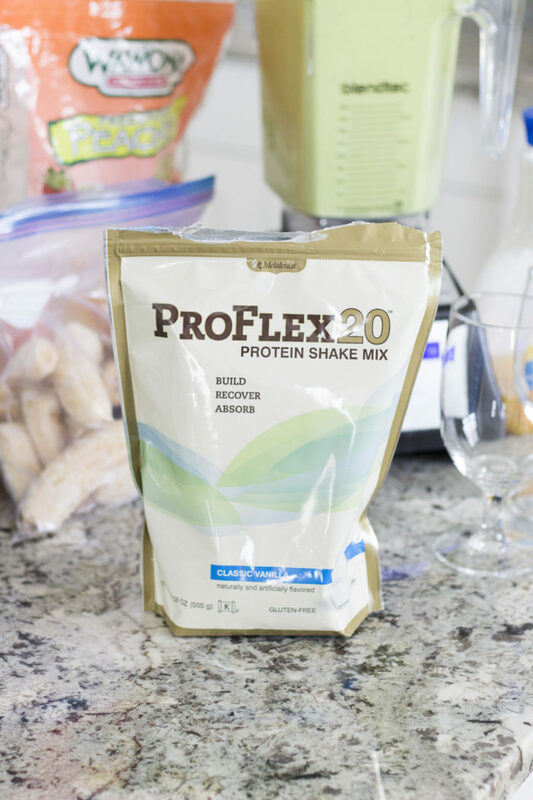 They have TONS of natural products and they aren’t any more expensive than the grocery store. I use their lotion for my babies as well. It’s a life-saver! 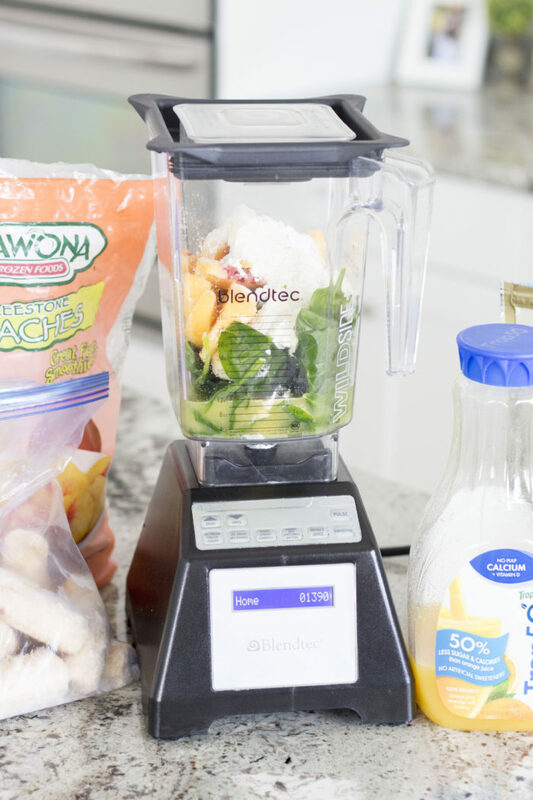 How much orange juice and water do you add to your smoothie?